When it comes to working out, including weight lifting or powerlifting, a lot of lifters, whether amateur or professional, use weight lifting belts. They are a very useful piece of equipment for everyone. In general, a weight lifting belt not only ensures your back safety but also improves your performance. However, just like other gear, there are a few things you need to consider when choosing the best weight lifting belt. But if you don’t know how, don’t worry because I’ll help you in this article, so just read on. It is quite obvious that wrapping a weight-lifting belt around your core can help stabilize it, right? According to research, wearing a belt when lifting weights can increase intra-abdominal pressure by 30 to 40%. That means the compression of intervertebral discs can be reduced significantly. This pressure ensures a tight core, thus, keeping your spine from collapsing when you’re lifting heavy weights. As mentioned above, wearing weight lifting belts makes heavy lifts safer for your spine, especially the lumbar spine which is the weakest area of the spine. Remember that the more stable your core, the better performance, and honestly, this is true for every kind of exercises. Besides, I don’t know about you but for me, a belt always makes me more confident for each big lift. More specifically, I don’t have to worry about my core anymore as it’s already stable with the belt around. Hence, I just have to focus on lifting the weights. For instance, without a belt, I can only squat 300 lbs, but if I have it, I can squat 350 lbs for the same amount of reps.
As the belts protect your spine, they are able to help you with compound movements such as Olympic lifts, deadlifts, squats, presses, and so on. All of these movements are to build overall strength and multiple muscle groups, thus, maintaining a tight and stable core is crucial. However, you can also wear a belt for any exercise in which you need to tighten your core. Honestly, I often use my weight belt even when I’m doing the bench press or standing biceps curl. Keep in mind that just because belts can improve your performance doesn’t mean you should wear them before any lift. In fact, if you depend on them too much, you can’t improve your core. I mean wearing a belt is important, however, what if you come to the gym and realize you forget your belt at home? You just walk away or what? My point is you should not use a belt until you’re not about to lift heavy weights, I mean above 80% of your 1-Rep Maximum. For example, if you can squat 100 kg for a 1-Rep Max, then you don’t need a belt until you want to squat 80 kg. Or else, you can’t strengthen your core, and that is what may stop you from increasing your lifts, pretty bad, huh? Additionally, make sure the top of the belt should not push against your ribs. Additionally, don’t let the bottom of the belt get wedged into your hips once they are flexed. However, that guide is not suitable for everyone. In my experience, just wear it in any position that is comfortable for you as long as you feel the necessary pressure against it. Keep in mind that a belt is what your abs push against. Hence, if you want to choose the best weight lifting belt, make sure it is wide enough. In my experience, it’s a good idea to buy a belt which is 4-inch wide all the way around. But once again, you still need to try on some belts to determine which one is best-suited to your body. This factor is also very important when choosing a weight lifting belt. Remember that a belt which is too thick is not always good as you’ll be uncomfortable and find it difficult to breathe during exercise. And of course, a belt which is too thin may not be supportive enough and can’t protect your back. My advice is to go for any thickness you feel comfortable with. And if you’re a powerlifter or you enjoy lifting heavy, it’s important to go for a belt that is between 10mm and 13mm thick. However, most lifters choose the thinner-10 mm belts as a 13 mm unit can be overkill for their needs. Anyway, it all comes down to your preferences. In general, there are 2 main types of weight lifting belts: Powerlifting belts, Bodybuilding or traditional belts. This type is specially designed for powerlifting so they are heavy duty, very thick and very. With a powerlifting belt, you can pull the buckle as tight as you need for lifting extremely heavy weights. If you are a powerlifting or anyone who enjoys lifting heavy, a powerlifting belt can be your best bet. However, if you are just a person with general fitness purposes or you don’t always lift heavy, do not choose this type. This is because they may be not really comfortable because of the thickness and stiffness. These belts are usually made of leather and they are thicker in the back than the front. Overall, they are not as thick and stiff as the previous type. Actually, they are only as thick as your pant belts. Therefore, they provide less internal pressure than the other type. All things considered, you can invest your money in a powerlifting belt for extra support and safety. Having that said, you don’t need to care much about these 2 types as it all comes down to the thickness. They are totally interchangeable if you’re not a serious lifter so once again, just choose the thickness that feels comfortable and supportive for you. There are 4 styles of buckles you can choose from: Velcro, single-prong, double-prong and lever. The Velcro allows you to tighten the belt really fast. In fact, you won’t feel much pressure against a Velcro belt as compared to other buckle styles. The Velcro also is likely to pop off and your belt will loosen over time. A Velcro belt doesn’t provide you the least support and is likely to pop off. Anyway, no matter which style you choose, it doesn’t affect that much on how the belt works. Therefore, just choose any buckle type you want for the most comfort. With a single-prong unit, you can easily adjust the waist size. Generally, there is not much difference between a single-prong belt and a double-prong one except for the fact that 2 prongs provide more stability. Also, 2 prongs can make the belt more durable, however, a little bit difficult to adjust the waist size. But I guess it’s no big deal for you, isn’t it? As you can see, this buckle allows you to tighten and loosen the belt much more quickly compared to the others. Furthermore, a lever belt is believed to be more durable and heavy duty than the other styles. Honestly, I prefer this one as it only takes me less than 3 seconds to get ready for a heavy lift. This belt is one of the most durable weight lifting belts I’ve ever known. It doesn’t tear, break or wear out like so many other opponents made from plastic, nylon, etc. Additionally, it features a heavy-duty metal buckle as well as many adjustment holes, which means it can fit various waist sizes. Thus, no matter how big you are, always fit you. The 4-inch wide design will help stabilize your back without bulking your body like some 6-inch belts. Apart from the great support, this one is very comfortable as it feels weightless, just about 1.5 lbs. You won’t have to worry about irritation or strain at all. Also, while so many belts are too stiff and bulky to roll up, you can easily roll up this belt and stash it in your gym bag. If you’re not a powerlifter or don’t need to lift extremely heavy weights, this product can be the best weight lifting belt for you. 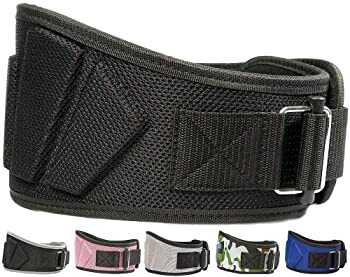 The only downside of this belt is that there may be some annoying poking or pressure near your hips, but it doesn’t always happen. Some complaints about poking and pressure near hips. The Fire Team Fit weight lifting belt is effective in promoting good form while you’re lifting heavy weights. The special design with the back thicker than the front can give your back extra support. With this belt, you can perform better when doing not only the squat or deadlift but also powerlifting movements like power cleans, clean and jerks. 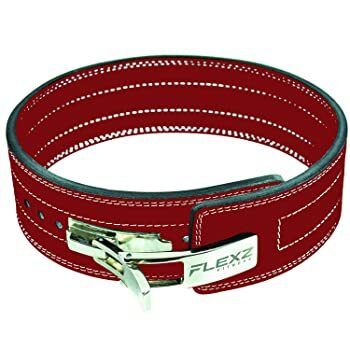 Furthermore, unlike other leather belts with a predetermined set of adjustment holes, with the unit, you can easily adjust tightness for desired support and comfort. Actually, that is what I like most about this Velcro belt. As mentioned above, this one features Velcro buckle, thus, the Velcro will lose its stickiness over time. Sooner or later, it will pop off. So if you’re a powerlifter or you always have to use a weight lifting belt, then consider this carefully before buying the belt. You’re looking for a powerlifting belt, just don’t hesitate to buy this one. Honestly, my first impression is that it looks very durable and firm. And actually, it is. The belt is designed with the highest quality sourced material and provides excellent back support. The belt features a highly durable stainless steel lever which can help you increase intra-abdominal pressure. Additionally, unlike other belts with predetermined adjustment holes, you can easily adjust tightness with the lever design. Besides, it only takes you a few seconds to tighten and get ready for a big lift. The lever also helps you make sure that the belt stays wrapped tightly around your abs without slipping or releasing. With this one, you can do everything without having to worry about your back, including from bodybuilding to powerlifting. Importantly, what makes this belt special is the lever buckle. There is only one problem and it’s about the price. Actually, it’s quite expensive as compared to other models but if you’re a serious lifter, it’s worth your consideration. Now, as you can see, it’s not really difficult to choose a suitable weight lifting belt. My advice is just to buy any belt that feels comfortable and supportive for you. This is because if a belt is not comfortable for you, no matter how expensive or perfect it is, just don’t buy it. 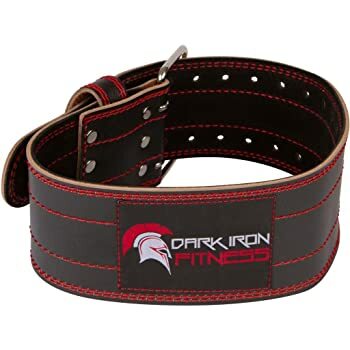 But if you still can’t choose yourself a belt, I’d like to recommend you to buy the Dark Iron Fitness weight lifting belt as it’s great for different use and affordable.